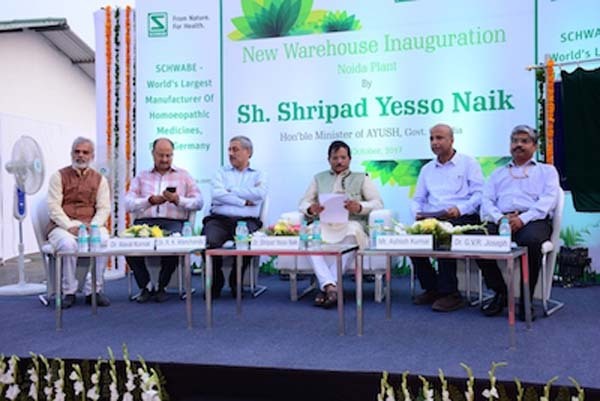 NOIDA.OCT.11: Hon’ble Minister for Ayush, Shri Shripad Yesso Naik, inaugurated the new warehouse facility of Schwabe India, one of world’s largest manufacturer of homeopathy medicines from Germany, on 11th October, 2017, at their NOIDA complex in Sector 60, NOIDA. This new warehouse is fully equipped to store and handle around 25000 SKUs and is surely one of its kind in Indian homoeopathic arena. Addressing the gathering, the Minister said that India, after Germany, is the second home to Homoeopathy. Schwabe’s Cineraria Maritima Eye Drops is a household name in India for the prevention of cataract. He also recalled from the history about Schwabe’s contribution in first homoeopathic pharmacopoeia and relevant drug rules. “I am happy that company has not only established this plant in India but also expanding to meet out the rising demand of medicines. I wish Homoeopathic industry should further invest more in quality production and focus on exporting Homoeopathic medicines. Our production should be of International quality” he said. He further stated that the Ministry of AYUSH, has specific mandate of promotion and propagation of Homoeopathy not only in India but across the world. Indian homeopathic practitioners are sought after across the globe for providing online treatment, teaching and even software development. Under the leadership of Central Council for Research in Homoeopathy, eminent scientists from different specialities such as physicists, molecular biologists, chemists, pharmacologist, nano technogists and even genetic experts are joining hands to undertake much required researches to further explore the science of Homoeopathy using latest scientific knowledge and technology. “I had recently inaugurated State of art Virology laboratory at Kolkata with the specific objective of developing new drugs and technogies for the prevention and treatment of viral diseases” he further added. He had elaborated that the CCRH is proactively interacting with reputed institutions/universities for joint research projects. So far about eight bilateral agreements have been signed with National Polytechnique Institute, Mexico; Royal London Hospital for Integrated Medicine, U.K.; Yerevan State Medical University, Armenia; College of Homeopaths of Ontario, Canada, WissHom and Robert Bosch Foundation, Germany, University of Rio de Janeiro, Brazil and University of Maimonides, Argentina. On this occasion Mr. Ashish Kumar, the Managing Director of Schwabe India, said that the Schwabe Group has been hugely investing in India in line with our Prime Minister’s Make-in-India initiative. That trend keeps continuing. We are planning to set up a new quality testing laboratory, which will not only do testing for this plant, but also for other countries. From this plant, Schwabe India has been exporting to Bangladesh, Pakistan, Sri Lanka, Thailand and other Asian countries. Company has plans to increase the exports in the coming years. The event was graced by Dr. R. K. Manchanda, Director General, Central Council for Research in Homoeopathy, who had emphasized on the fact that the industry needs to invest more on R&D. Dr. G. V. R. Joseph, Director, Homoeopathic Pharmacopoeia Laboratory (HPL), who was present at the occasion, said that the HPL is working on improving standards of homoeopathic medicines and will work with the industry to achieve the goal. Also present on the occasion were Mr. Vinay Kumar, Member, Authorization Committee for Organ Transplant, Dr. Naval Kumar, Honorary Advisor to Minister of AYUSH.